In its 2018/19 Budget released in May, the Federal Government unveiled a swathe of projects and initiatives to receive a portion of the $24.5 billion allocated towards infrastructure. Similarly, the Victorian Government outlined a major investment in infrastructure in its 2018/19 Budget, including $2.2 billion to upgrade arterial suburban roads and $941 million to fix regional roads and establish a dedicated country roads body – Regional Roads Victoria. With roads being named some of the big ticket items in respective state and federal 2018/19 budgets, new design and construction methods are needed. This means new products are increasingly required to reduce costs but also deliver them in a timely and efficient fashion to mitigate disruptions to the public and meet future demand. With an increasing market emphasis on “doing less with more”, delivering projects with fewer disruptions to the public and using environmentally friendly products, Colas Western Australia (CWA) State Manager Stuart Nugent says Colas Australia sought to develop a prime that could meet the changing demands of the industry. Following the mining downturn in the west, he explains that CWA and SAMI Bitumen Technologies – also part of the Colas Group – began exploring different and more eco-friendly ways of producing a prime product that didn’t rely on volatile petroleum distillate. So, a more environmentally conscious solution was developed. Mr. Nugent says road bases are traditionally prepared for surfacing with prime coats to protect the granular based during construction and help reduce dust. The prime penetrates the granular surface and provides a good bond between the underlying base and new bituminous surface layer. In the past, most primes were made from bitumen cutback with kerosene or other petroleum-based materials that are slow to cure and emit volatile organic compounds (VOCs). The issues with cutback primes, Mr. Nugent says – in addition to the release of VOCs into the environment – is its potential harm to flora and fauna if it runs off into waterways. It contains solvents and vapours which are potentially harmful to workers and its curing time, which can range from 24 to 72 hours and result in traffic delays. “If you go back to the 1960s and 1970s, it was common to use cutback primes made with tar and kerosene, which was the stuff the workers ended up breathing in,” he adds. 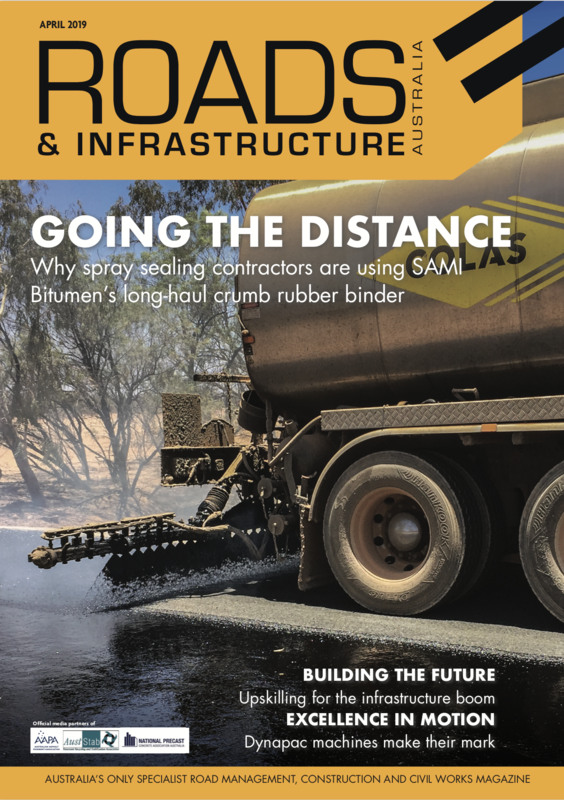 Colas Australia saw an opportunity to pool its resources and knowledge – through the technical expertise of SAMI and the surfacing contracting experience of CWS – to develop an alternative, eco-friendly prime – SAMIprime Eco. SAMIprime Eco is an emulsion-based bitumen that has been fluxed with a bio oil. It contains no petroleum solvents that have flammable vapours, are hazardous to workers or release harmful VOCs into the environment during spraying. Mr. Nugent says the use of SAMIprime Eco also removes the risk of an explosion potentially occurring during handling, which can be the case when cutting back hot bitumen with kerosene for priming. Mr. Nugent says the economical treatment can be used as a soil stabiliser and dust suppressant, adding that the product has superior penetration into compacted base materials and effectively protects the base from moisture ingression. Likewise, he says it provides excellent adhesion between the base and the succeeding course. One of the key differences to cutback prime, he says, is the significantly reduced curing period. A primed surface using SAMIprime Eco can be sealed or asphalted in as little as two to three hours after application as opposed to cutback bitumen which can take at least a day. “On cooler and more humid days it may take longer than two hours to cure, however, from experience the cure time will be short enough to apply a final seal on the same shift,” Mr. Nugent says. “Overall, the fact we can release the road back to traffic a lot quicker is a massive benefit. Normally, with cutback bitumen, we have to wait 24 to 72 hours for all those harmful VOCs to evaporate,” he adds. While ideal on paper, SAMIprime Eco has also proved effective in the field. In 2016, CWA assisted Main Roads Western Australia (MRWA) in undertaking a trial of the prime in Western Australia’s Wheatbelt region. “We used it initially on the widening/overlay works on the York to Merredin Road from 2016 onwards to expedite sealing during grain carting seasons,” Garnet Gregory, MRWA Regional Materials Manager for the Wheatbelt region, explains. The initial trial site consisted of 10 kilometres of full-width (nine-metre) seal, with priming executed under traffic in two halves at a time and traffic kept off the SAMIprime Eco at all times. In the trial, the SAMIprime Eco emulsion penetrated anecdotally up to two millimetres into the surface of the basecourse, which Mr. Gregory says is not anticipated with a standard bituminous emulsion. He says one of the major outcomes on the project was a faster sealing process with short curing time. “The main benefits have been the time saving with a shorter sealing process, but also the added benefit of being able to seal later in the season when temperatures are cooling down where a designer would not normally use a hot spray seal,” Mr. Gregory says. He says the use of SAMIprime Eco enabled both prime and the robust initial seal being applied on the same day under traffic, which is an innovation previously not available to the department’s project managers to streamline their sealing activities in an efficient and economic manner. Its eco-friendly makeup also gives it a significant point of difference to traditional cutback primes, which resonated with the MRWA team on the trial. “It is different in that the product does not contain hydrocarbon diluents such as kerosene, which require time and temperature to drive off the cutter out of the prime before sealing,” Mr. Gregory says, adding that the Wheatbelt region arm of MRWA is considering the use of SAMIprime Eco on future projects as they arise on a case-by-case scenario. 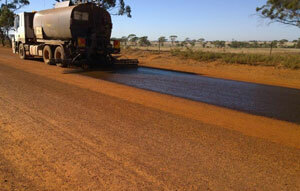 Since the trial, SAMIprime Eco has been applied on a further 11 locations in Western Australia. Mr. Nugent notes that there has been excellent bonding of granular wearing course reported on each occasion and no stripping of any kind has occurred in each instance to date. “We’ve now applied SAMIprime Eco in a range of cold and warm applications in Western Australia, which has amounted to nearly half a million litres sprayed now. Now, we’re also talking to another contractor to use it on one of the biggest projects in Western Australia – NorthLink,” he says. Mr. Nugent explains that Colas is always searching for new ways to deliver environmentally conscious, sustainable and longer-lasting products, with SAMIprime Eco a fruitful representative of the company’s step in this direction.